Today, it is a Dubai based diversified multinational conglomerate which operates in the areas of Trading and Distribution; Engineering, Procurement and Construction; Exploration and Production; . Dodsal Group's Trading and Distribution arm operates under Dodsal Enterprises Pvt. Ltd, as the Agency Division and markets and distributes chemical and engineering products in India for more than 15 companies from 10 countries spanning North America, Europe and Asia. 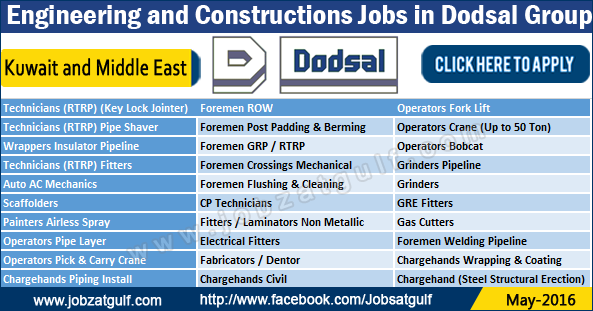 Dodsal Group is one of the leading EPC players in the Energy, Industrial and Infrastructure sectors and has successfully implemented projects in over 22 countries in the Middle East, Europe, Africa, the Indian Subcontinent and South-East Asia. Dodsal Engineering and Construction Pte. Limited, the holding company for the Group's Engineering and Construction activities also carries out infrastructure development and management projects and has already implemented on a finance, build, operate and transfer basis, pipeline projects in India and North Africa.